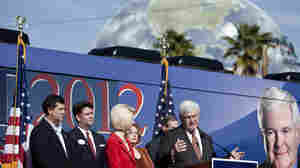 Can A Win In Georgia Bring Gingrich's Campaign Back From The Dead Again? March 3, 2012  To hear him tell it, the rumors of Newt Gingrich's demise have been greatly exaggerated. The former House speaker is banking on a big showing Tuesday in his home state of Georgia to salvage a campaign that's been declared dead a number of times. August 31, 2010  The Georgia Theatre in Athens burned from the inside out in 2009. Owner Wilmot Greene is rebuilding, balancing historic building requirements with 2011 building codes. He's hopeful about reopening soon, and bringing in some cash. August 11, 2010  Nathan Deal wins Georgia GOP nomination for governor as Karen Handel concedes. August 10, 2010  Nathan Deal and Karen Handel were locked in a tight race for Georgia Republican gubernatorial nod.